Soup is the ultimate comfy cozy food. 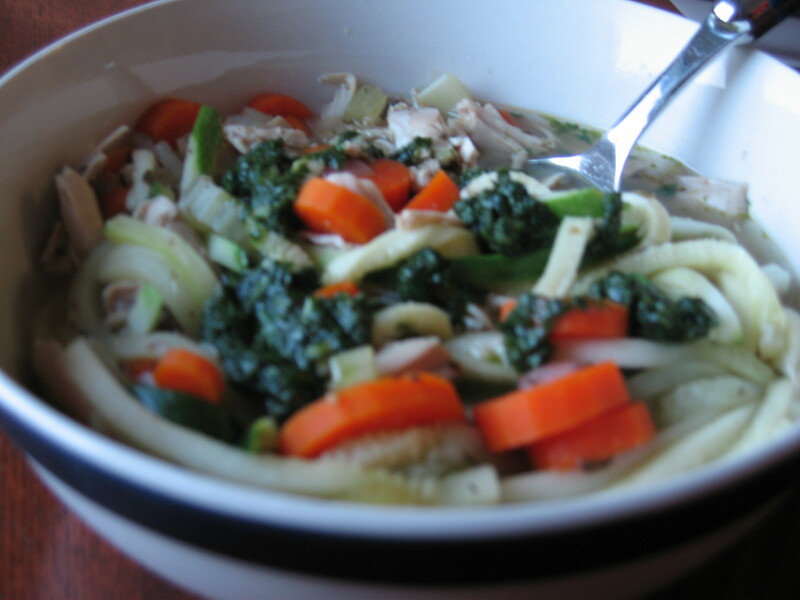 This healthy take on an old-fashioned favorite, Chicken Noodle Soup, is Danielle Walker’s recipe (her recipes and her story are amazing, so please check her out). I added more vegetables and topped it with basil oil for dimension. When I’m in a time crunch, it helps to buy a rotisserie chicken and let it cool before shredding it (which is a perfect time to chop the carrots, celery and onion). 1. Shred cooked chicken into bite size pieces or cubes and place in large stock pot. Then, add cleaned and chopped celery and carrots, diced onion, chicken broth, sea salt, black pepper, garlic powder, thyme, oregano and bay leaf. Cover, bring to a boil and simmer for 25 minutes. 2. While pot is simmering, use a mandoline slicer to julienne cut cleaned zucchini (you can peel the zucchini prior to cutting if you want it to look more like noodles). Set zucchini “noodles” aside. 3. Now make the basil oil, adding basil, olive oil, salt and garlic to a food processor. Blend, place in an air-tight container and set aside. 4. Once the 25 minutes is finished, add the zucchini and continue simmering for another 8 minutes. 5. When soup is finished (total of 33 minutes on the stove), remove the bay leaf, spoon soup into the bowls, drizzle with basil oil and feel all warm and cozy!